Comquest, the Annual National Commerce Academic Meet organized by Department of Commerce of Lady Shri Ram College for Women took place on 15th and 16th October with a diverse array of events from popular B-Plan competition to insightful Committee Simulation. The two-day event comprised of eight commerce specific events which gave the participants a platform to discuss the ever changing fads of the known corporate arena. The first day of the highly awaited meet started off with a Panel Discussion on topic ‘Emerging Start-Up Culture in India’. The event saw principal as well as Commerce department faculty members along with participants from Bhutan, Kathmandu, and various colleges of Delhi and NCR region. Panelists included founders of some top notch startups such as Food Talk India, Carzonrent, I Impact India and so on. The discussion was moderated by Ms. Nagma Sahar, as the panelists spoke about their personal experiences and take on the fast growing startup culture in India. Another highlight of the day was ‘Gameplan’, the B-plan competition. In all, 11 teams participated from various colleges like NSIT, Aryabhatta College, Motilal Nehru College, Keshav Mahavidhyalaya and even from colleges based in Nepal and Bhutan. Judges were Mr. Rohan, Mr. Sumedh and Mr. Abhed. 1st, 2nd and 3rd positions were all taken by NSIT students. Consolation prize was given to the team from Nepal. Finally, there was a business quiz ‘Les Quizerables’ conducted by The Dais as a part of Comquest 2015. The quiz masters for the event were Balasubramanyam Pattah, Raman Umamaheshwaran, Gokul S and Aastha Mathur. The event saw participation of 100 teams having two members each and the prelims had 30 questions and 8 teams advanced to the finals. The Final round witnessed a tight competition between the finalists and Sreshth Shah and Raktin Vag emerged as winners. The event was a grand success and it was a treat for the audience who gained a lot of knowledge. On day two of Comquest, there was India High Level Economic Meet – a committee simulation, Paper Presentation Competition namely ‘Vortag’, Best Manager Competition called ‘Virtuso’ and Stock Maze. For the event Best Manager Competition, there were 19 participants and three rounds. The first round was related to auction bidding where each participant was given budget of Rs. 15 crores and he had to purchase items within this budget for a luxurious hotel. In the next round, a case study was given to participants. For the final round, five participants were selected. They were given a product and they had to think of a unique product in replacement of that product. 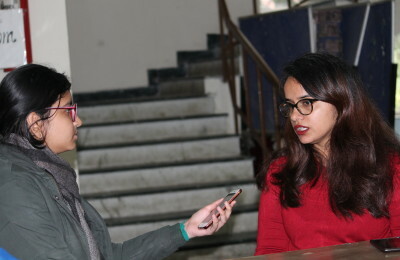 Previous PostStudents of SBSC raise awareness about potters Next PostDaulat Ram College organises Controversus ’15, Annual Fresher’s Conventional Debate.